1. How do you rate this set? Seems like I am on the Ninjago reviewing blaze and even though this is a set from 2014, it feels great to embark onto this project. 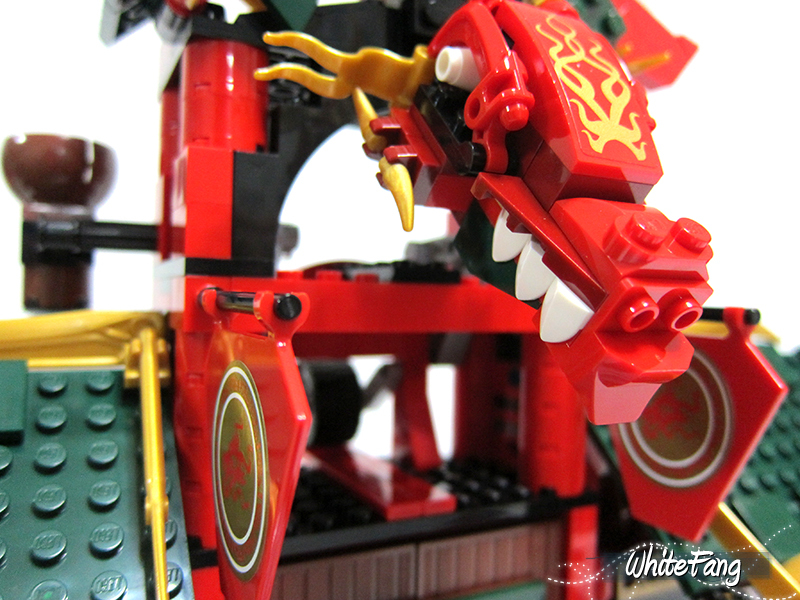 It thrills me greatly as a reviewer to build up and review this majestic set for Eurobricks and it is my great honour to be given such a chance to focus on this mammoth Ninjago set. 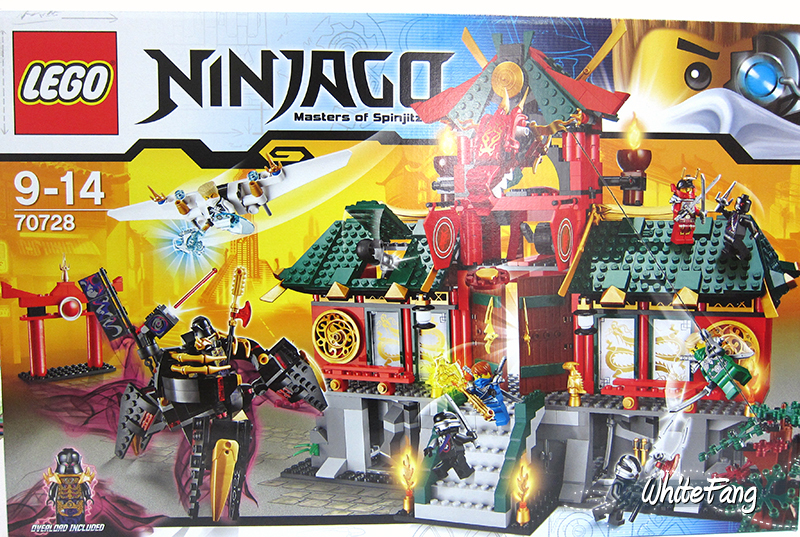 Although I have not watched the reboot of LEGO Ninjago Cartoon series when the heroic Ninjas battle against the rising OverLord and his cunning Nindroids, but I wanted to buy this set for the way it is being designed. 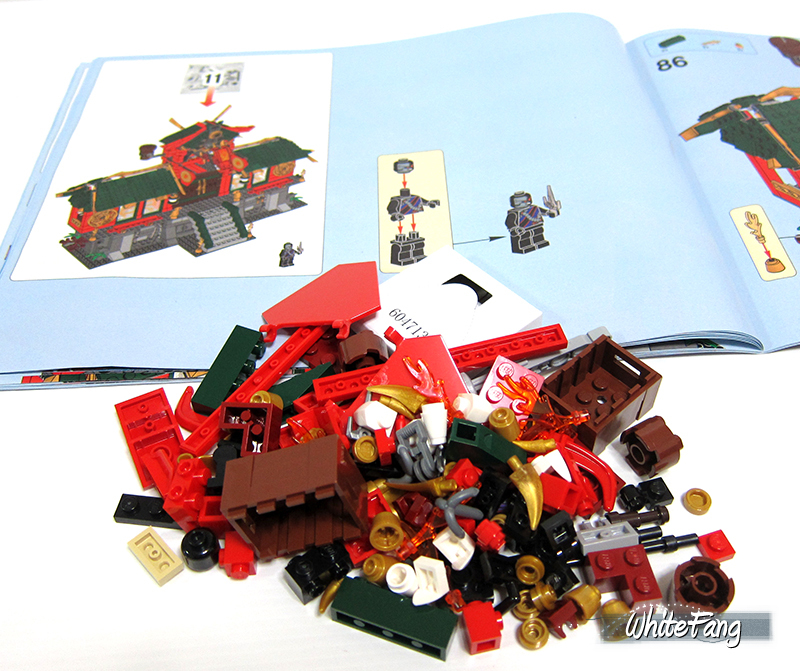 Unfortunately, I did not acquire any 2014 LEGO Ninjago sets except this lucky set and I will largely review this based on the set design context and I will not be able to relate it to the actual cartoon series for reference. 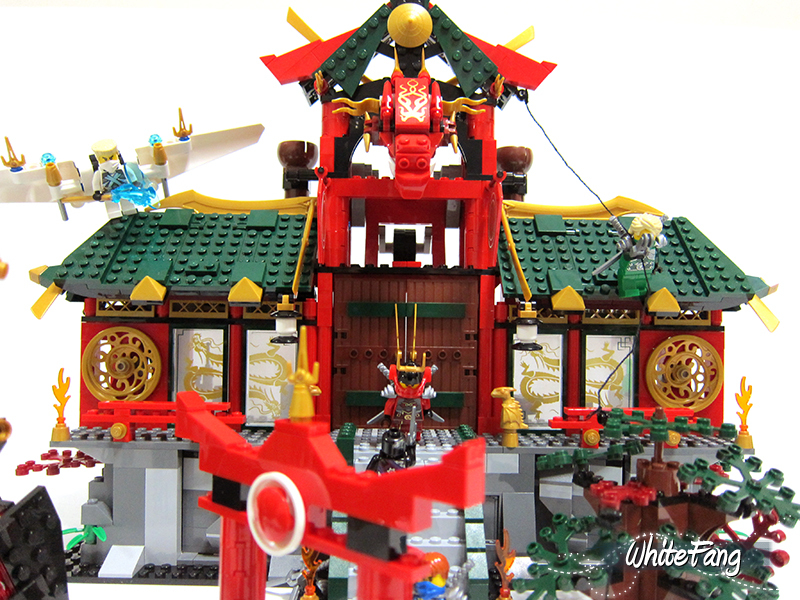 Nonetheless, I hope I can provide and share good insightful views of this 70728 Battle for Ninjago City which I deemed as one of the crown jewels of the LEGO Ninjago Theme. 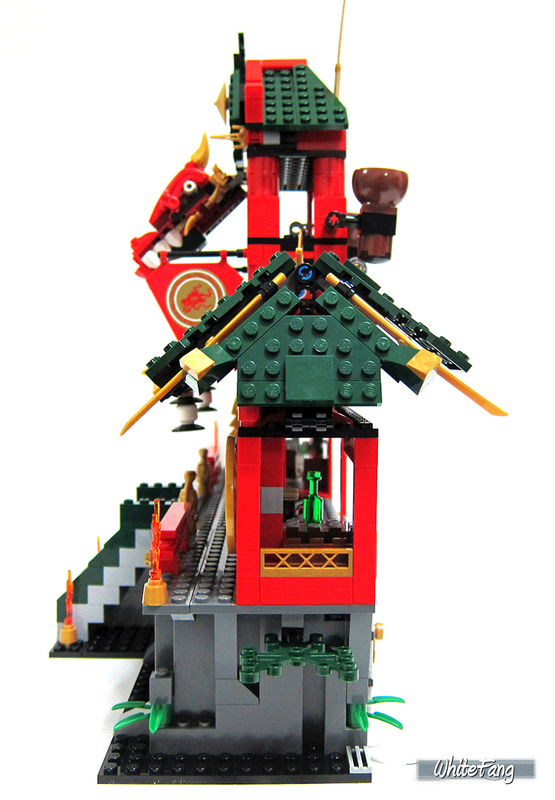 Defend the awesome Ninjago Temple against OverLord attacks! The huge evil OverLord has powered up and is threatening to take over New Ninjago City. 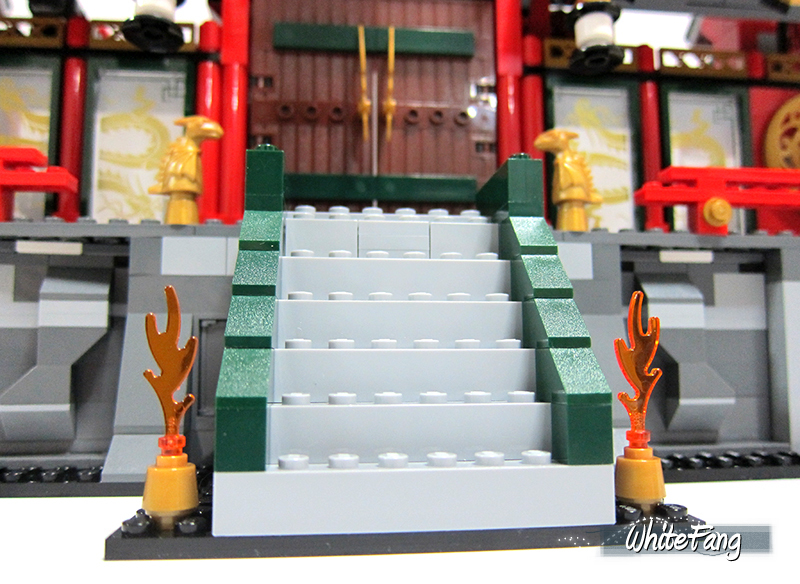 Help the Ninjas to defend the Ninjago temple using its awesome array of hidden features. Plan your strategy in the control room and activate the catapult stairs to send intruding Nindroids flying. Evade laser-cannon fire from OverLord and retaliate by triggering the tower’s dual catapult and hidden disc shooter. Zoom down the zip line from the roof with Lloyd, spin the rotating walls to reveal hidden weapons, and glide into battle with Jay. Outsmart those Nindroid invaders and lock them up in the prison! 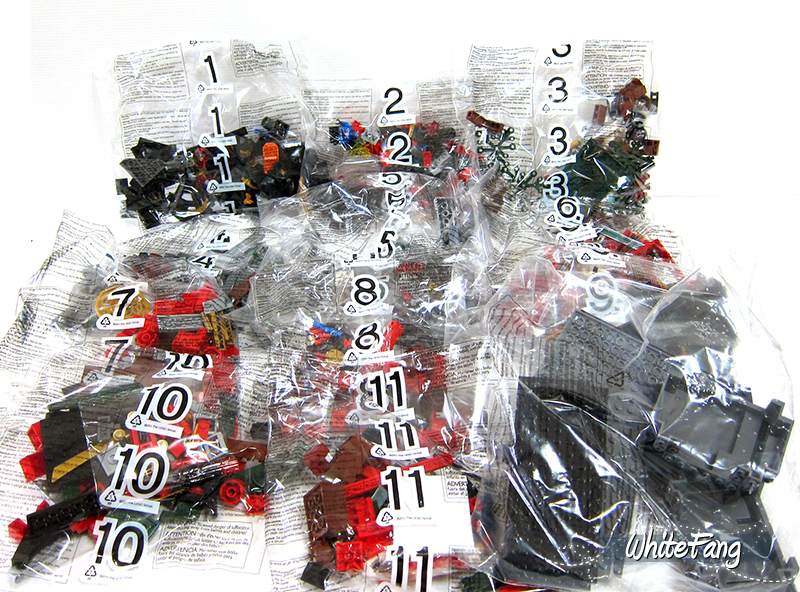 Includes 8 minifigures with assorted weapons and accessories: Jay, Lloyd, Zane, Nya, OverLord and 3 Nindroids. • Activate the catapult stairs to send a Nindroid flying! 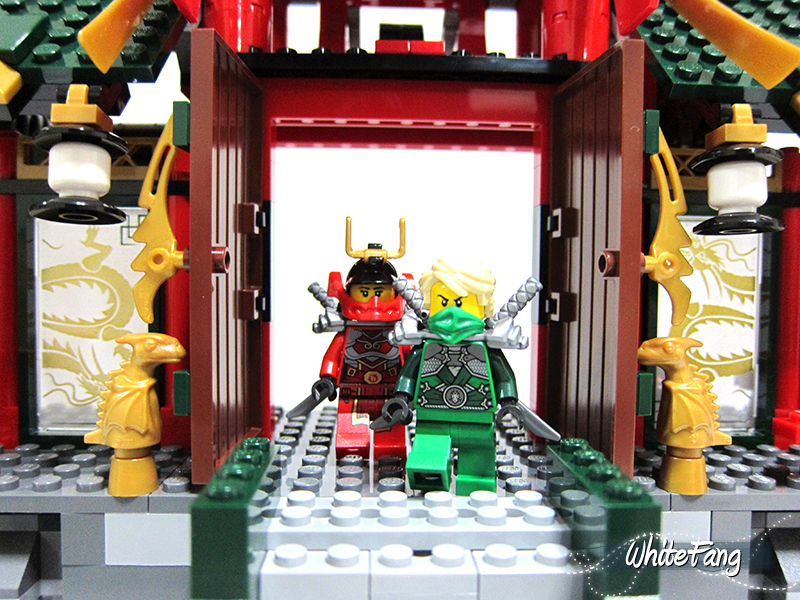 I am always a huge fan of classic Ninja and Samurai and Ninjago somehow gave me a chance to be close with this concept again, even though LEGO Ninjago is an action based theme which revolve on a fictitious Ninjago City where good versus evil storyline. 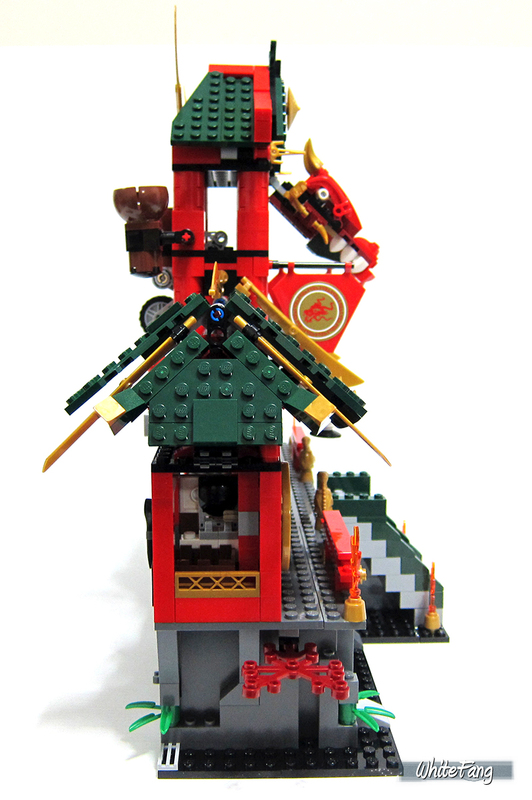 I could have to admit that this home grown original design concept by TLG is very well received among the children since 2011 and Ninjago has gone even stronger than before since the Ninjago reboot. Well, there is not many chance that we can get such an impressive set like this. 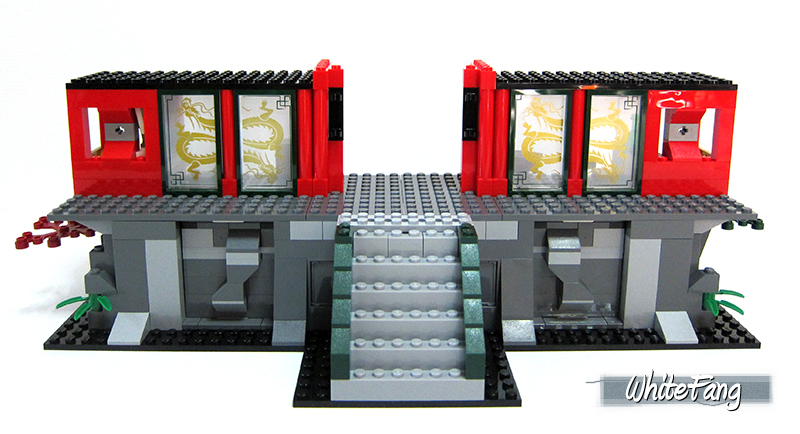 In fact, the main focus of this set is the Ninjago Temple. I have not seen the cartoon and I really can't relate how accurate it can be, but it is definitely going to be a very fun and intense building process. 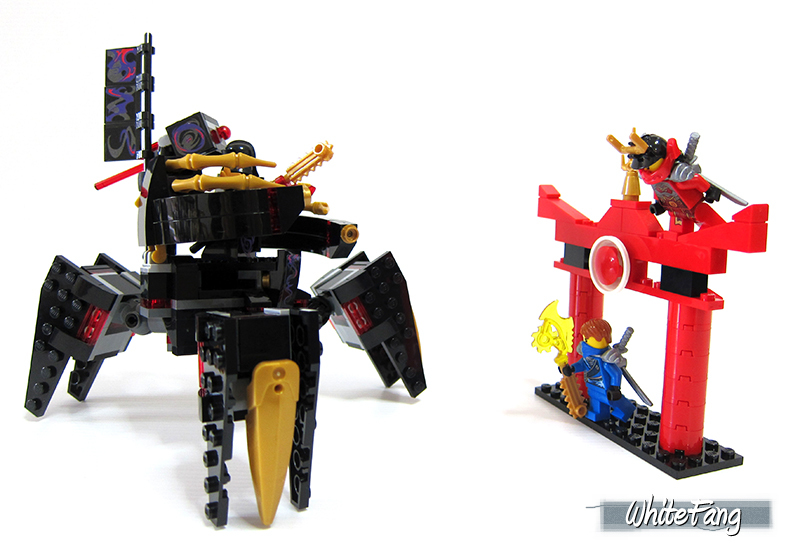 Why did I claim this is going to be an ultimate crown jewel for the LEGO Ninjago Theme? 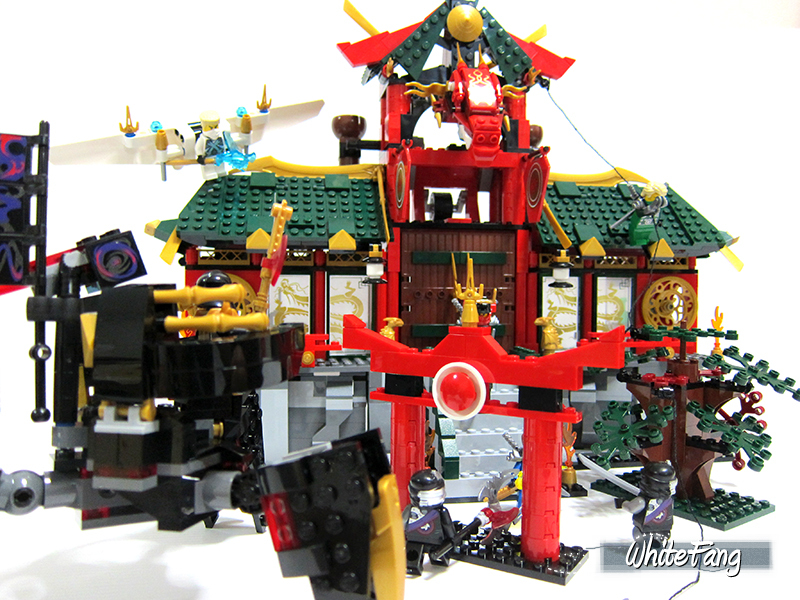 It is because this is one of the biggest LEGO playset in the Ninjago theme among their releases so far. 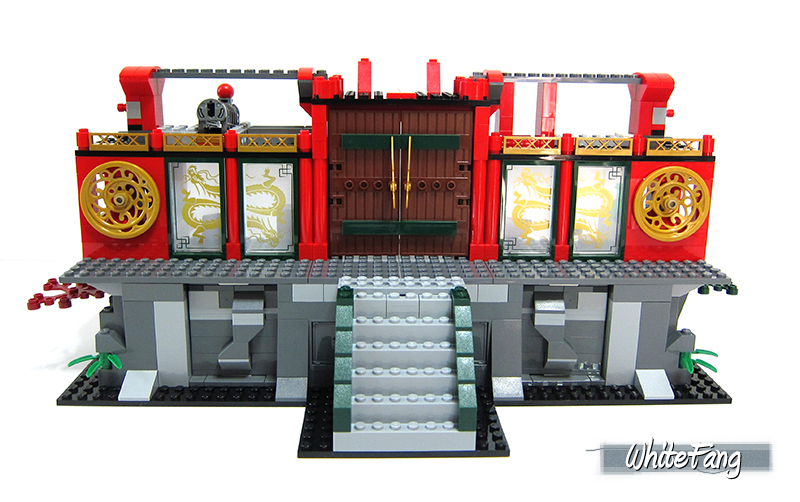 You could argue that similar playsets such as the 2505 Garmadon's Dark Fortress, 2507 Fire Temple, 70505 Temple of Light and 70749 Enter the Serpent could also be equally good, but I beg to differ. 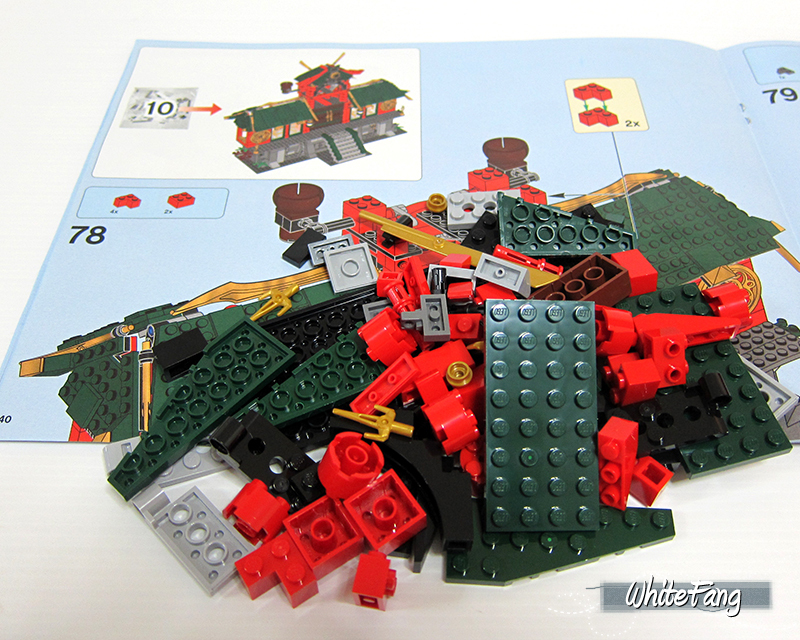 These mentioned playsets are nowhere near the 1000 pieces count and for this 70728 Battle for Ninjago City, this set has triumph with 1223 pieces count and most of the bricks goes to the building of the majestic Ninjago Temple. 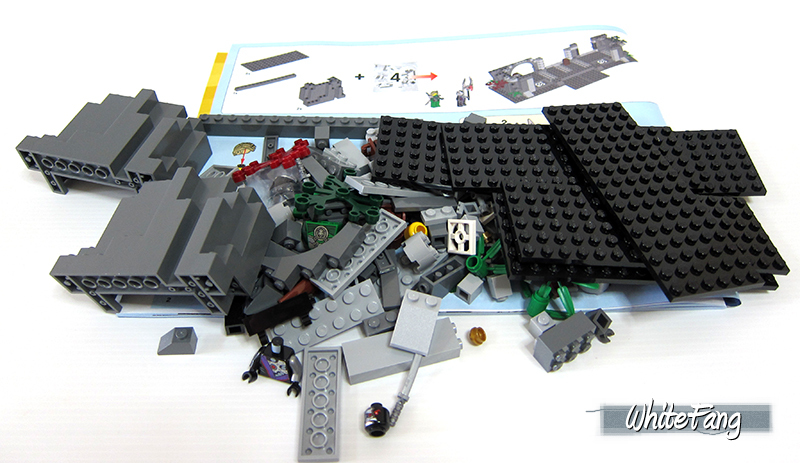 This is by far, the biggest playset ever released for LEGO Ninjago Theme. I do not count vehicles, boats, dragons, creatures and small to medium play scenes. 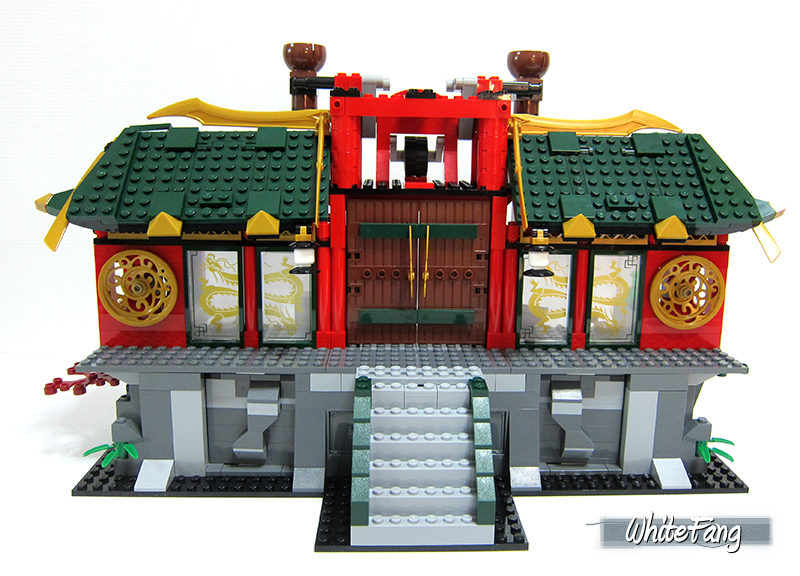 This is the most epic set ever, encompassed excellent assortment of minifigures and playability features within the Ninjago Temple. Endless and timeless fun playing for me, accompanied with superb building oriental design. I will elaborate further in this review. The sealed box comes with 12 mint packs and among them, 11 mint packs is numbered and grouped from one to eleven, a disappointing sticker sheet and three instruction manuals to guide the user to build up the set. The instruction manuals are packaged in a sealed plastic together with the sticker sheet. Do note there is no paper cardboard at the back to support the manuals. Thankfully, the manuals are straighten without any visible bending when I opened the box. 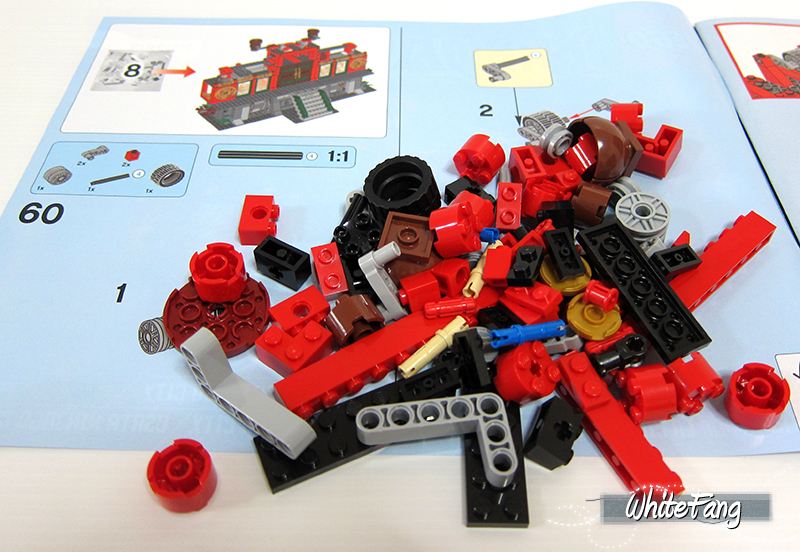 After the set building is completed, these are the remaining generous spare parts which is spread across the packs. 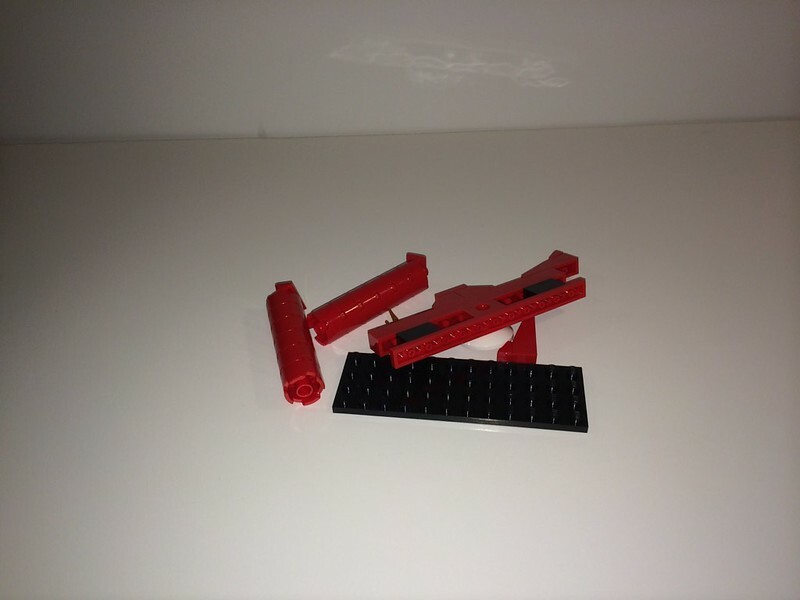 You can view the spare parts for packet 1 including an orange brick separator, packet 2, packet 3, packet 4, packet 5, packet 6, packet 7, packet 8, packet 9, packet 10 and packet 11. 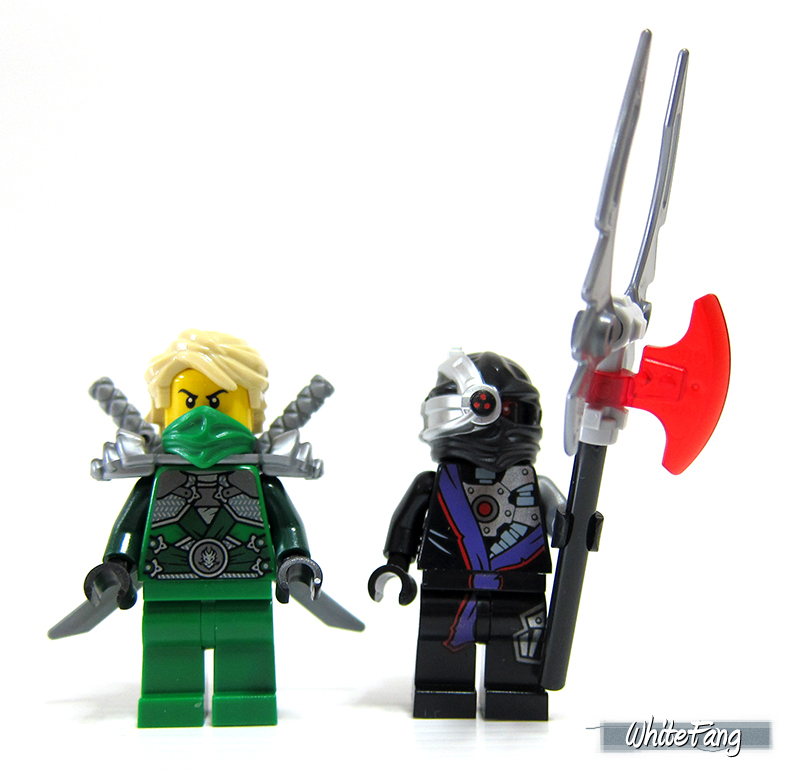 As you may have noticed, there are plentiful of useful spare parts like the inclusion of mini masks, additional weapons like the katanas and sais which are great for assembling your minifigures with essential weaponries. 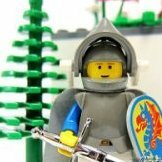 In the next few sections, I will be focusing more on the minifigures aspect. 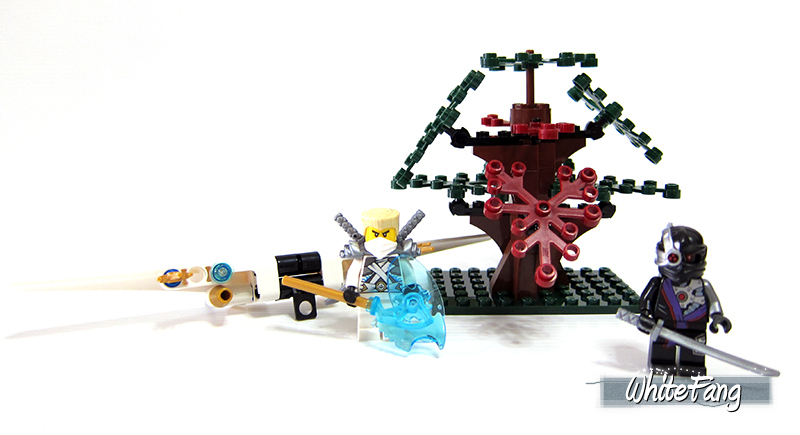 In this 70728 Battle in Ninjago City, you will get a whooping total of eight minifigures. 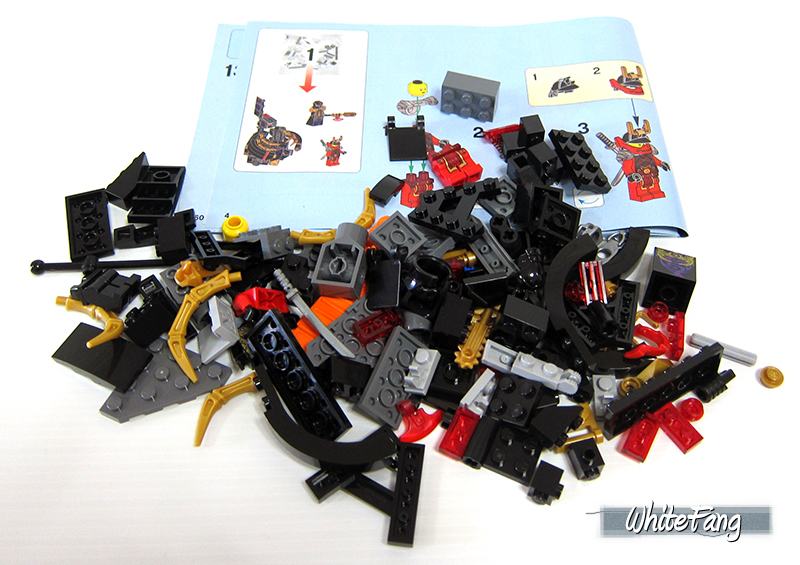 This is by far the largest amount of minifigures being made available to any single LEGO Ninjago set till this date. It is massively incredible. The maximum amount of minifigures were just seven and only made available to the 2507 Fire Temple and 9450 Dragon Battle. It was awesome to see eight minifigures being made available in this set and are equally distributed between good and evil. Before I show you the rest of the minifigures in greater details, you may take a quick flip to see the back view of the full minifigures range. To note, these minifigures are spread across different allocated packs. Seeing this group photo of the good guys being placed together, simply melts my heart. 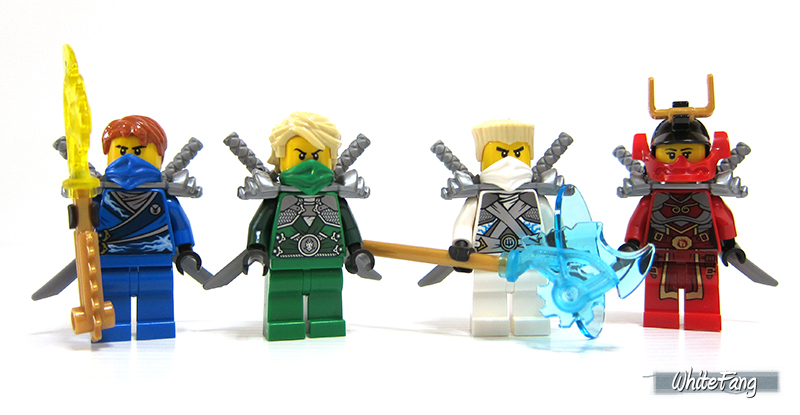 With the exclusion of Kai and Cole, by just buying this single set, you are able to acquire the other main characters of the Ninjago universe which are from the left to right order, Jay, Lloyd, Zane and Nya in their full reboot Ninjago outfit. If you need to get Kai, he is available in the 70721 Kai Fighter and 70727 X-1 Ninja Charger. Likewise, if you need to get Cole, he is available in the 70720 Hover Hunter and 70723 Thunder Raider. However, it is still not as good as these fully armoured minifigures which is ready for total combat. Furthermore, I always find their outfit to be pretty generic which could easily substitute to be a regular ninja. 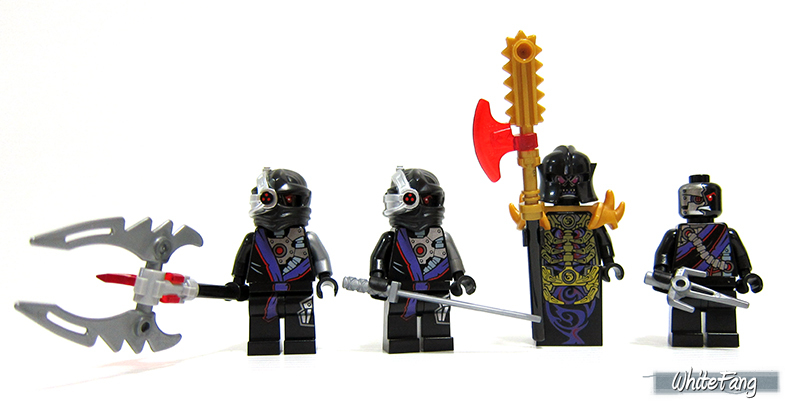 Among the four of them, Zane and Jay are holding the two out of four's translucent techno weapons which looks like it can rid the evil for good. This is to showcase the evil powerful OverLord and his henchmen known as the Nindroids or causally known as the robotic ninjas. The OverLord is an evil spirit and the main antagonist. He created the Stone Army out of an unbreakable material only found on the Dark Island and commanded the Nindroids. According to the Serpentine's prophecy, he is The Golden Master. OverLord's design is pretty solid from the torso to the skirt and I am fond of the idea that this particular minifigure is given the option to interchange with a regular black leg piece. His black and golden slate armour is mean and contain a strong evil aura. Without his evil aura, how could he able to command his Nindroids Drones and Warriors. Well, those are quite nasty looking cyborg robotic ninjas but I don't quite like these as it looks rather futuristic. Well, this is the age of technology, so it got to be rather science-fiction looking. When I opened the first packet, I assembled the OverLord and Nya. I am pleased with the minifigures' design and you can see them in closer details without their accessories on and their back printing as well. Well, I am glad that Nya's outfit stayed quite close to the original Samurai X design. While, the next popped up minifigure in the second packet reveals Jay which is holding the translucent yellow techno weapon. He still don the original blue colour schema and over here, you can see him without his mini mask. You can also view the back printing after removing the sword holder. The next set of minifigures in the third packet reveals Zane and Nindroid. 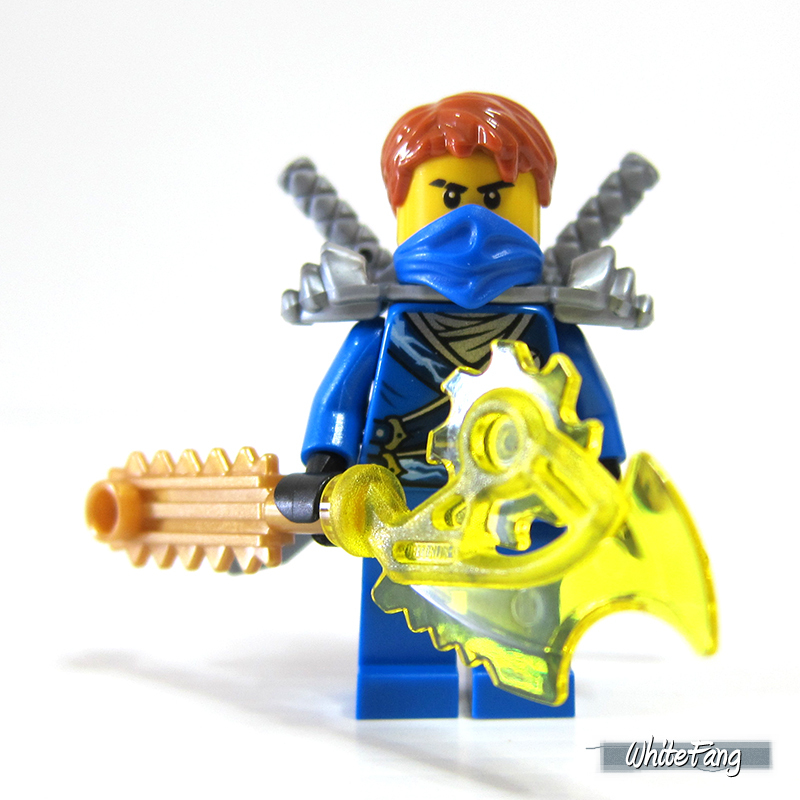 Zane is seen holding a translucent blue techno weapon and he is the only minifigure to hold a translucent blue shield. 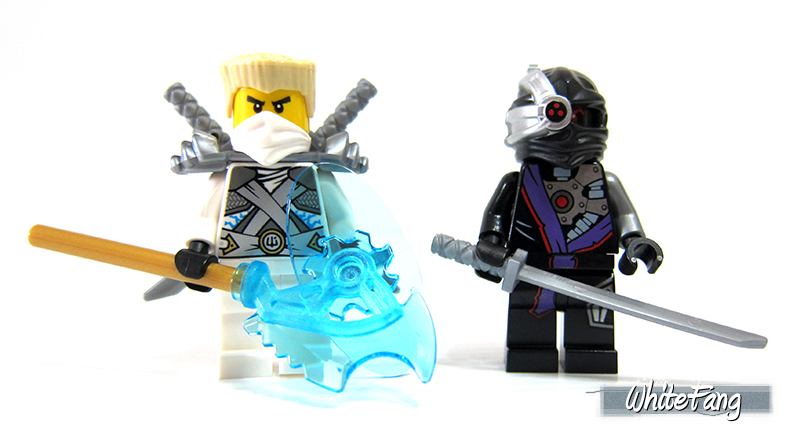 Zane retains his original white colour schema and over here, you can see both minifigures without their headgear on. You can also view the back printing clearly. 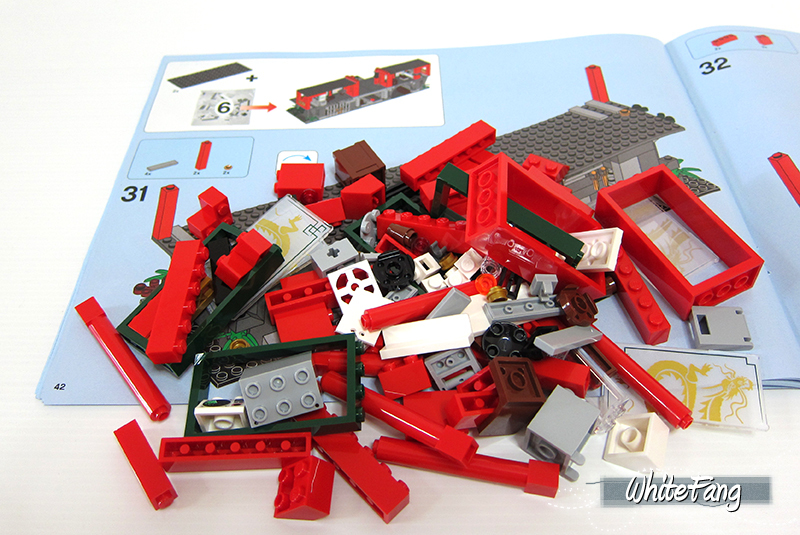 The subsequent set of minifigures in the fourth packet reveals Lloyd and Nindroid. Lloyd retains his original green colour schema and over here, you can see both minifigures without their headgear on. You can also view the back printing clearly. 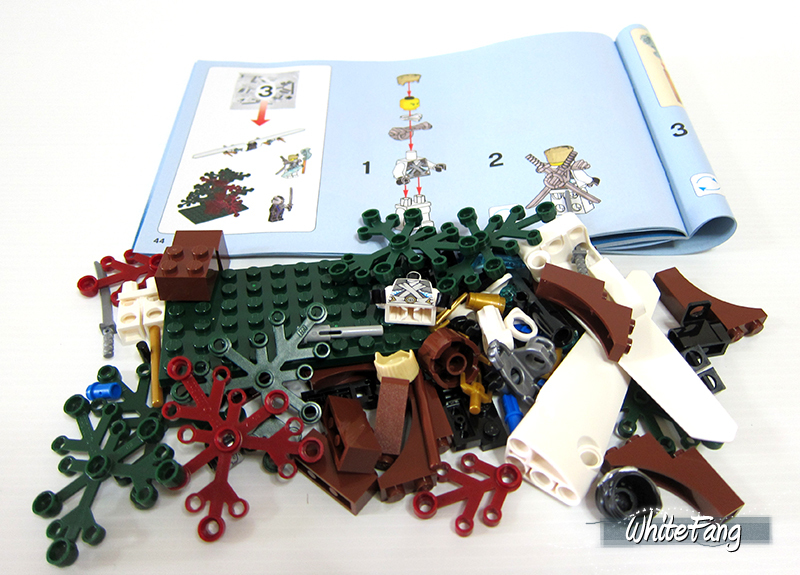 The last set of minifigure in the eleventh packet reveals a Nindroid. 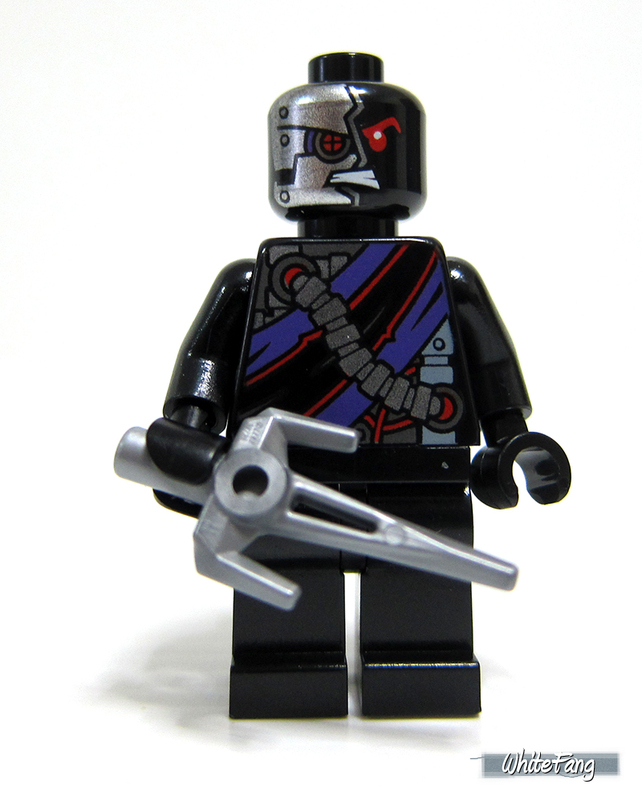 There is nothing special about this minifigure except for the lack of the black ninja head wrap which I could love to see it being included. It was a pity that they have to differniate both of their Nindroids in this manner. You can also view the back printing clearly. 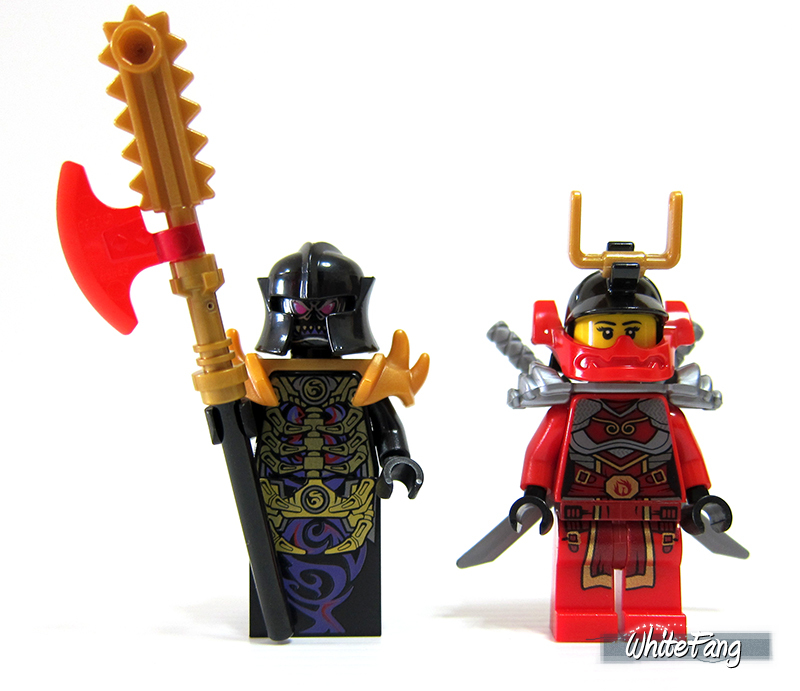 The completed built revealed the first set of minifigures namely OverLord and Nya. It also half-assembled on the mechanical OverLord. At this point, I had to apply the dreaded stickers onto the OverLord and blame on my feeble fingers, I kind of mess up the stickers alignment. The completed built for this packet reveal the minifigure, Jay. 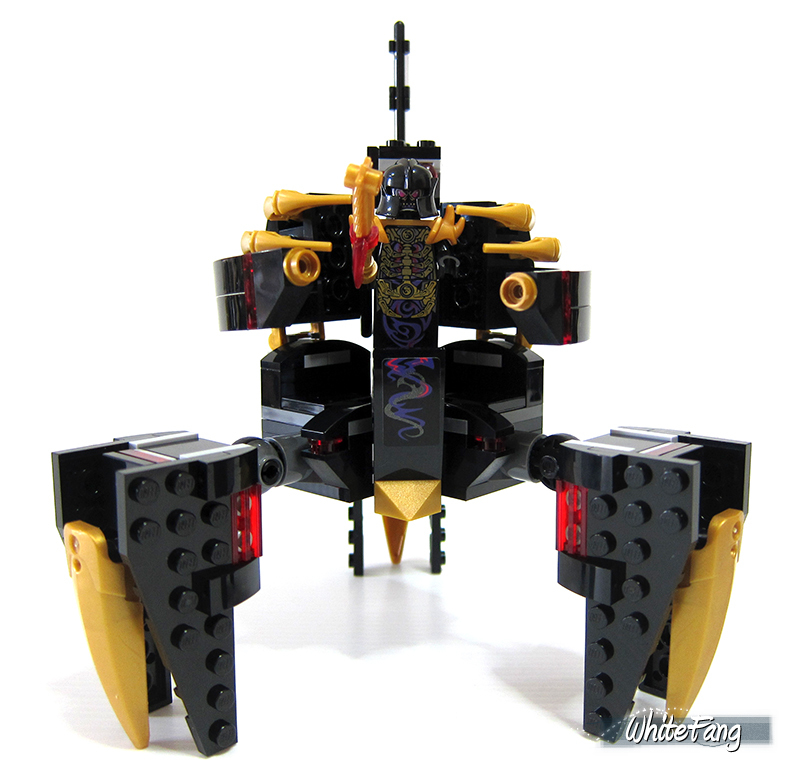 It also encompass the second half of the mechanical OverLord's legs and the simple brick built temple arch entrance and this is the back view of it. The mechanical OverLord is a medium-sized built which include the new spring-loaded shooter that launch red missile for attacks. 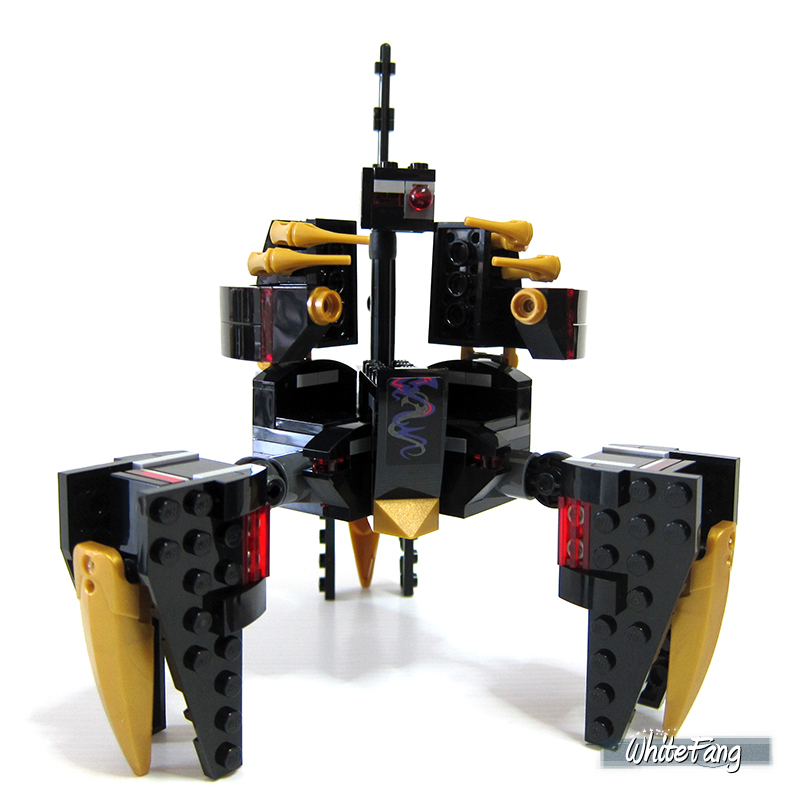 The three golden mechanical legs is attached to the central core and the legs are quite posable as well. I am rather annoyed with the stickered flags which I have clearly made a blunder of the arrangement which is unfortunate irreversible as can seen in the side view. By placing the OverLord minifigure beside it, you could roughly know the scale of this built. The built for this packet is good, as it allows me to see a brand new design of a brick-built tree. The connecting pins held the tree foliages together and at the same time, it is able to adjust the angles in an up and down manner. This glider is very sleek looking as it can glide through the skies and launching aerial flick missiles at enemies. 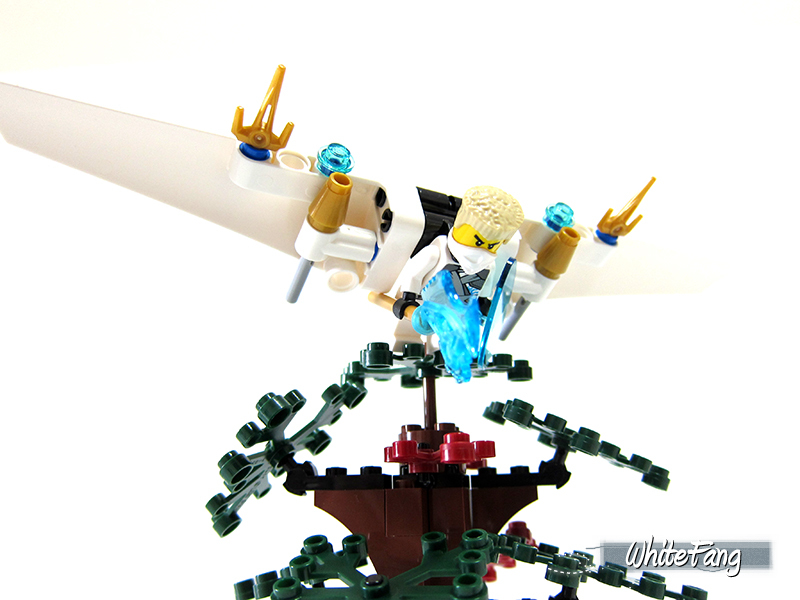 By removing the sword holder, you can place and attach the glider onto the minifigure directly. You can see the back view of the glider and another image of Zane preparing himself to glide. From the building process of packet 4 to packet 6, we are building up the strong foundation of the base of temple. It also includes the building the steps to the proposed entrance as well as the dungeon and secret treasure room. 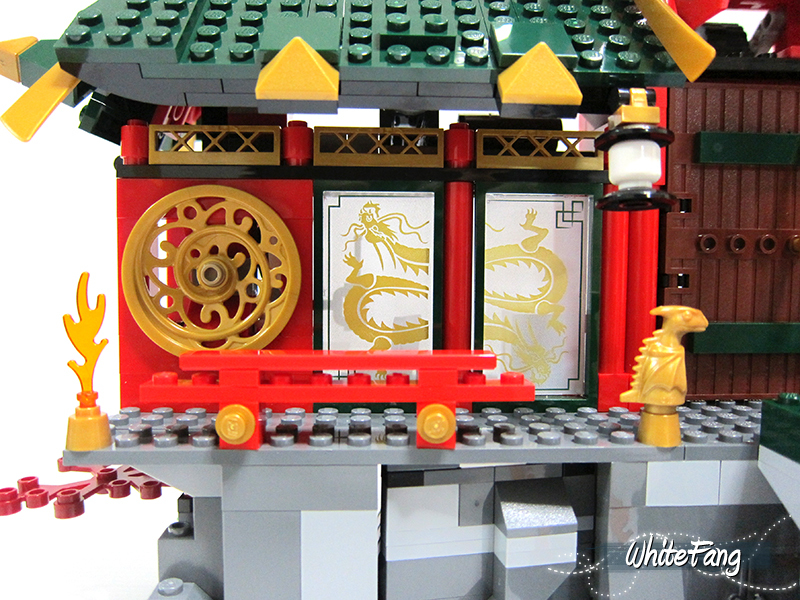 These printed dragon window tiles are one of the best parts I have ever seen and it is very versatile for future oriental MOCs. We also begin to see the construction of the second level of the temple and we are halfway through to the remaining packets. 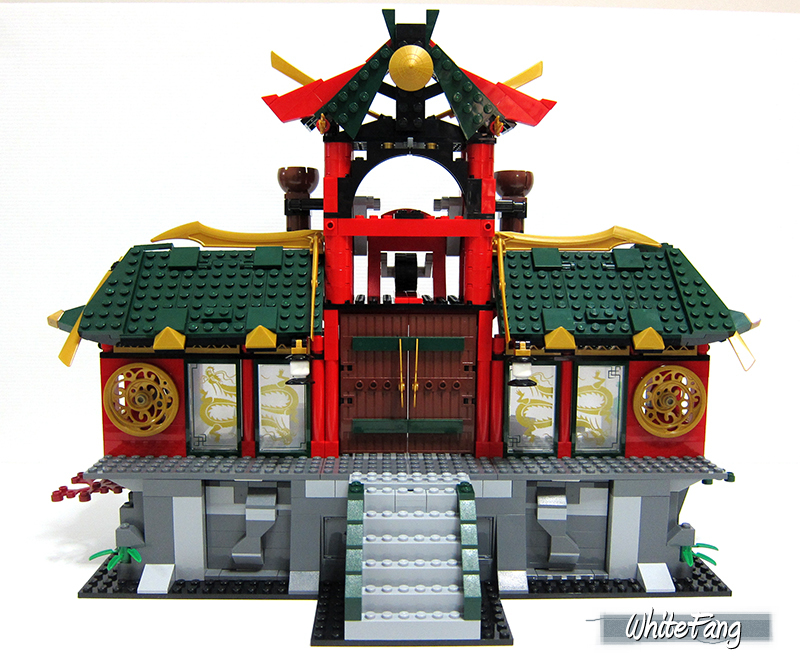 Finally, I have built finished of this massive and majestic Ninjago Temple. It is one awesome building experience which I can't do it in just a day. I had to build this set at two separate weekends just to get this photo-taking process complete. It encompass full architecture structure of beautiful exterior and nice interior with some interesting playability features as shown here. The design gave me a very strong oriental feeling and I greatly appreciate the fine details and awesome colour schema or red and emerald green. One particular amazing thing that I like is the side of the roof tile, it can opened up to reveal the side of the interior. Now, let me show you some of the highlighted playability features. The first one will be the secret weapon room. There is nothing too special except for the placement of the treasure chest at the base of the temple. The second one will be fire the catapult. You placed round logs onto the hard-to-notice firing catapult like this, and you ensure the default firing mode first before activating the dual firing catapults. The third one will be the dragon blade launcher. The launch disc will come out of this front right from the red dragon sculpture's mouth. Placed the launch disc beneath the activation mechanism and you roll the wheel and it will launch the disc right from the inside to susceptible attackers. This launch mechanism is not as powerful as those spring-loaded shooters. The fourth one will be the nindroid lock-up. You have a typical looking dungeon with a nice printed circular lock. Well, you can see Jay and Zane escorting a prisoner in there. The fifth one will be the hidden rooftop shooter. You will not even probably think that a big arrow will come right out of this rooftop. 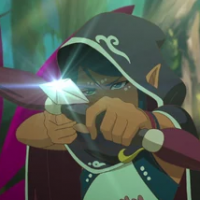 It can shoot a big arrow right through the roof when you least expected it. You can launch the firing mechanism which is located at the back of the building. You may also notice that the ammunitions for the next playability feature is stored there. The sixth one will be the activation of the stairway trap. You press the red lever in order to disrupt the incoming enemy before reaching the main wooden doors to trip and fall. The mechanism for this feature is not too great and the force could only sustain momentarily. The seventh one will be the ninja control room. There is nothing too special about it, except that it can house a crate of tools. However, the computer control console is meant for the duty ninja to provide surveillance for the Ninja Temple. From the screen above, it appears to have already detected multiple intrusions. 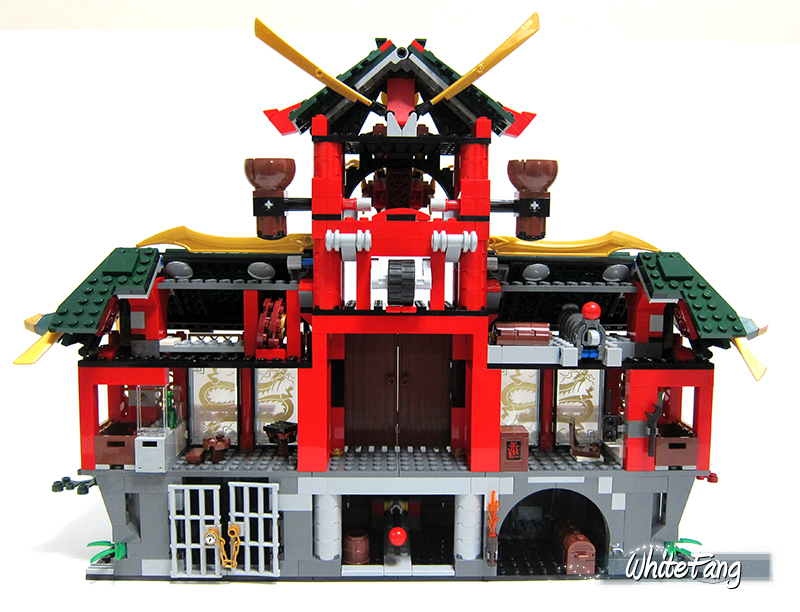 Other than the mentioned playability features, the Ninjago Temple also have a chill out area and kitchen for the Ninjas to hang about and a sleeping quarters for them to rest too. It also have secret weapon entrance over here and here. You probably do not notice much and thought it will be just a part of the temple foundation and here. To conclude, I enjoyed building and love this set very much. I am always fond of oriental building designs and this design is a complete new benchmark. I am very impressed by the solid built of this design. Even though this building is massively huge and tall, but it does not take the fact that it has a stoic appearance from afar. I will definitely keep this set safely in the assembled manner and hopefully integrate with my existing classic ninjas and samurai. I will most probably modify the temple slightly and removed the modern looking furnitures and equipment in order to retain the original oriental charm. 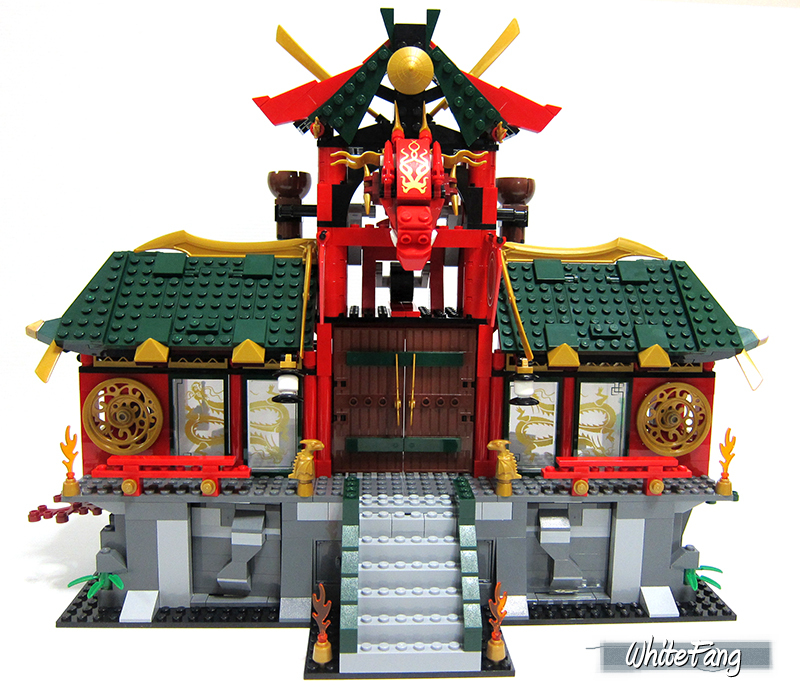 Well, it certainly can't compare itself with classic Ninja buildings like the 3053 Emperor's Stronghold and 6093 Flying Ninja Fortress which will always be classics and this 70728 Battle for Ninjago City will be a set not to be reckon with as it has just established itself with a higher benchmark. You definitely ought to get this set if you can and don't miss it. I hope every one of you enjoyed reading this simple review of mine. Comments and Criticisms are strongly welcomed. 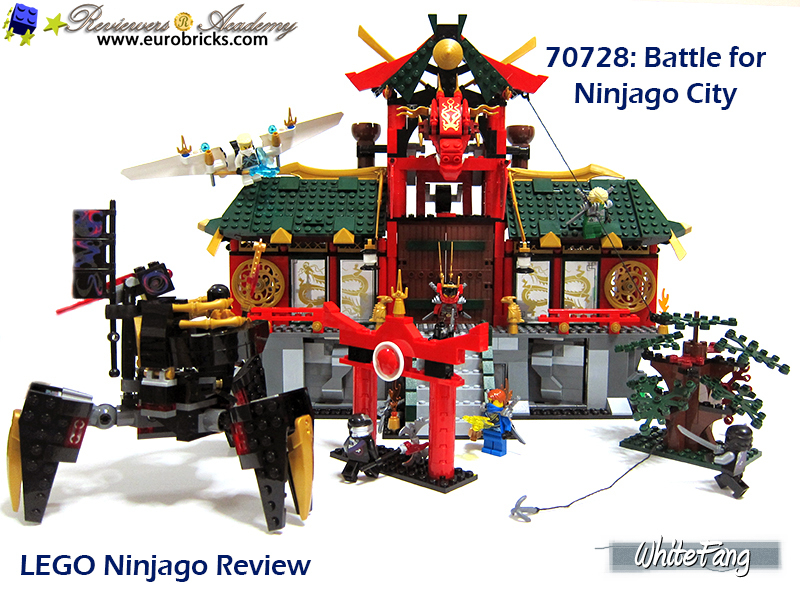 I am very pleased to present to share with all of you on my latest completed reviewing project of the 70728 Battle for Ninjago City. Please feel free to leave your thoughts! Another superb review! 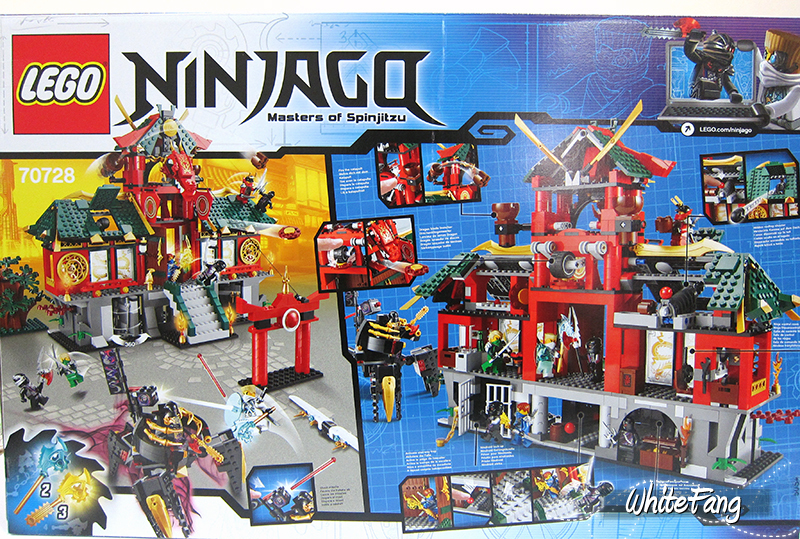 Set is also excellent, most "Ninja" of all Ninjago sets. Some excellent colours and designs in this set, its on my list of look-out-for sets (for a slight price drop, money does not grow on trees) on that wave. Even gives a hint of Exo-Force, seeing as all the tropes and cliches come from a similar source. Thanks for this review and keep 'em coming! Wonderful review and thank you for sharing it with us. I always thought about getting set but then other projects took the precedence but after reading your review I decided this set will be my "to buy soon list"
Great review of a great set - you must have enjoyed this! Thanks for the review, I originally dismissed it but based on your positive review I might just reconsider! Good review, but when you say this has all the main characters but Kai, you're forgetting that Cole isn't in this set either. He can be obtained in the Hover Hunter and Thunder Raider sets. I got this set for Christmas and find it amazing. One thing I love about it is that it actually feels marginally livable. No bathrooms like we might see in a dollhouse-style theme like LEGO Friends, but it does have a kitchen and a single cot to sleep in, which needless to say is more than most LEGO castles end up getting! 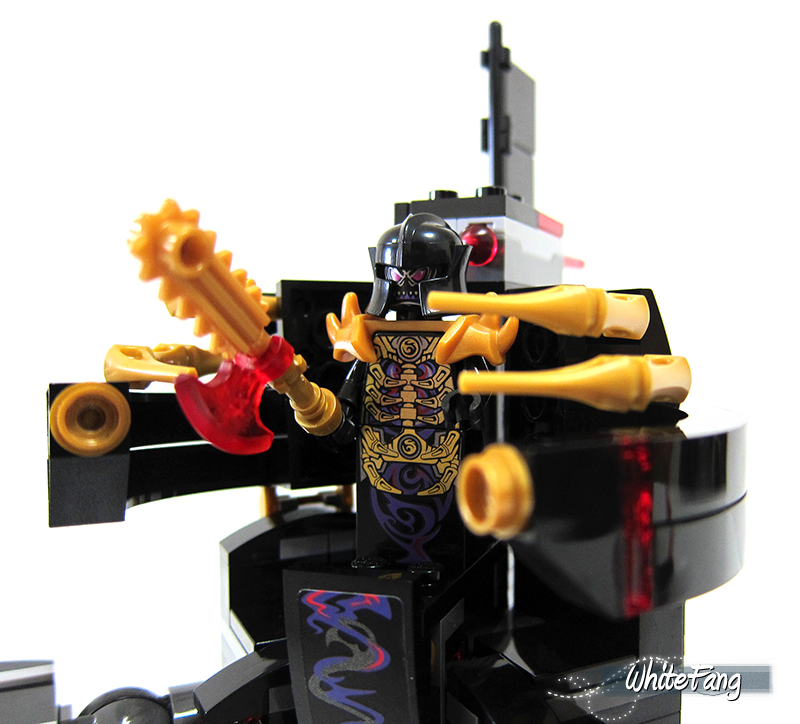 I wonder if the inclusion of these kinds of livable details might have been in part to appeal more to female Ninjago fans. After all, judging from the LEGO Friends, Elves, and Disney Princess sets, those kinds of "creature comforts" are important to girls. And according to the writers for the Ninjago TV show, the show's viewers are around 30% female, so it would be good form on the part of the set designers to consider that audience when designing sets for the theme. I feel the same way about some of the other design changes for last year's sets, like the introduction of new female characters and the ninja getting costumes that show their beautiful bishounen hairstyles! I've been keeping up with Ninjago fan art on deviantART for years and it's amazing some of the drawings the theme's female fans come up with. It's good to get a sense that that segment of the fan community is appreciated despite this being mainly a boy-oriented theme. 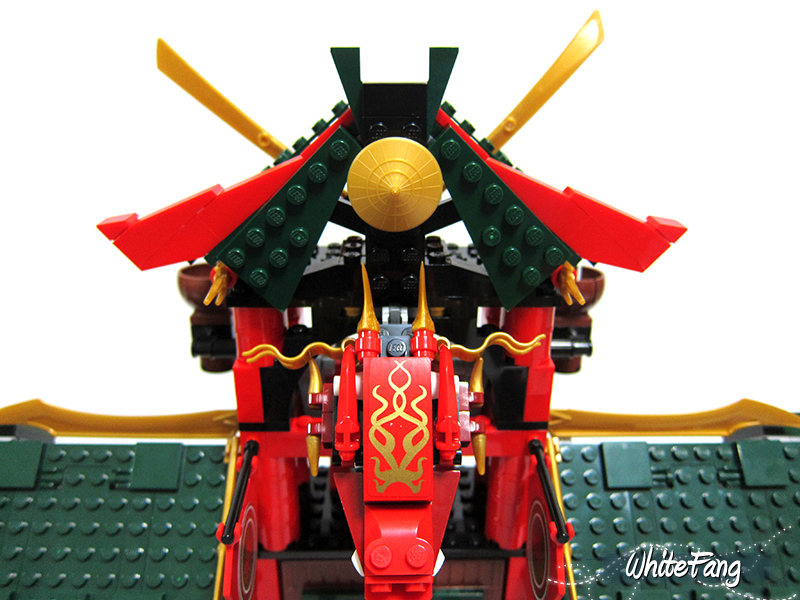 I love the brick-built dragon head in this set. It feels very ornamental and decorative. The angled roofs are also quite elegant, and the rocky foundation feels very powerful. The play features in the set are also quite nice. 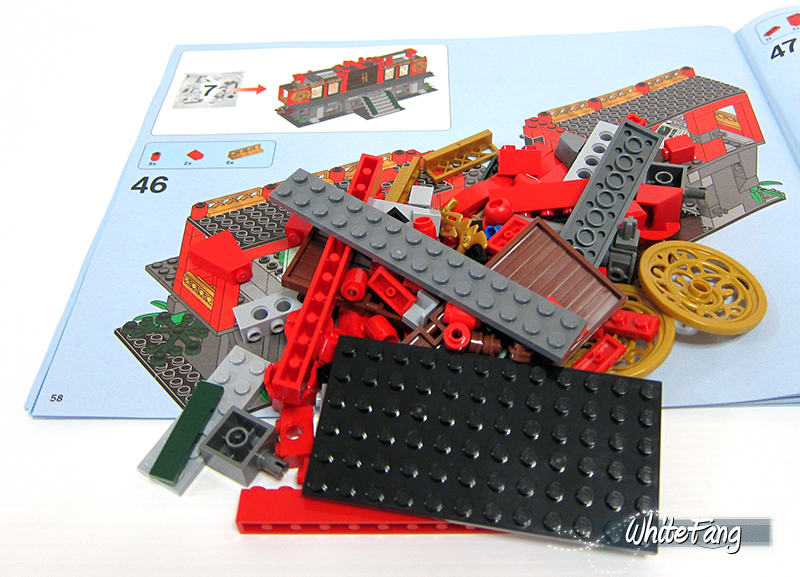 Overall, I feel like the LEGO designers have really been doing a great job with this theme in recent years! Just received the overlord from BaP, such a great figure! Fantastic review as always WhiteFang. I just finished this one last night. What a great set. Easily the best of the wave for Ninjago. It comes up to and even in many ways surpasses the wonderful Fire Dragon Temple. 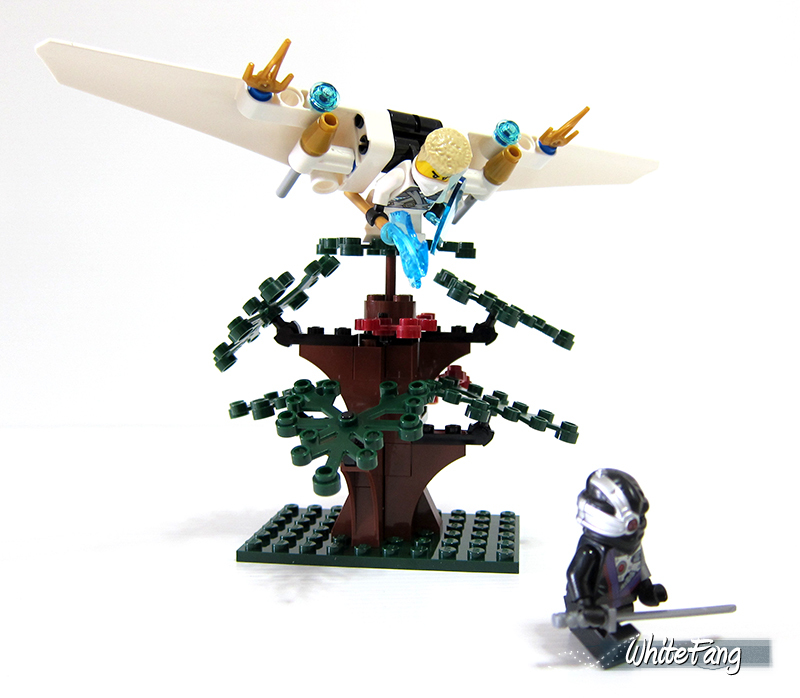 This one is a must have not simply for Ninjago fans. It can easily find a home in a Castle or City based display. The stylized Asian building is gorgeous. Elevating the temple up onto the rock base is brilliant. It really makes the structure stand out. The only negatives I have are Zane's glider which seems rather plain and pointless and the Overlord mech, which while a nice design feels woefully out of place with the Asian Temple. Like parking a classic Space ship in the middle of a Castle or Pirates set. I also wish they would give Nya an alternate hair piece. She doesn't wear the helmet all the time. Thank you so much guys. I really enjoyed this set very much. Thank you Peppy. Well, this is even better than Exo Force and I pretty enjoyed Ninjago as itself, excluding the concept of playing spinners and some strange vehicles which I find it hard to relate. Oops, my bad. Do pardon me. Thank you Aanchir for highlighting this. How could I forget Cole. I have included and updated this information in my review. Very interesting thoughts and I didn't thought of it until you have pointed it out. It does somehow promote liveability other than playability. Awesome that you have finished yours last night. I agreed that the elevation is very nicely done and bring the structure to a much higher ground. Well, I am not fond of the add-ons though and merely love the set for the building. Great review as always Whitefang! Great review. One Thing I would have liked to see was the spares. 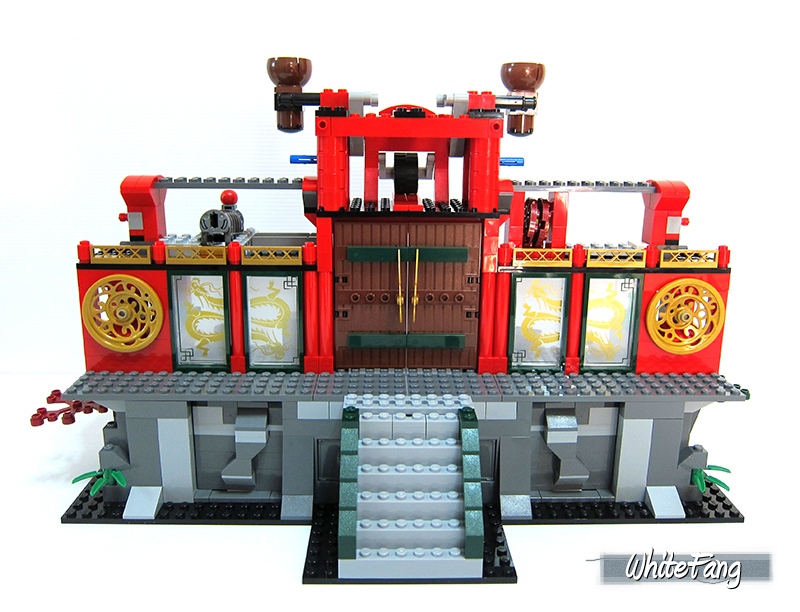 Thx a lot for this great review of an outstanding Ninjago set. I am very happy that I bought it yesterday for a good price (€80). Otherwise I would have regreted it in future. 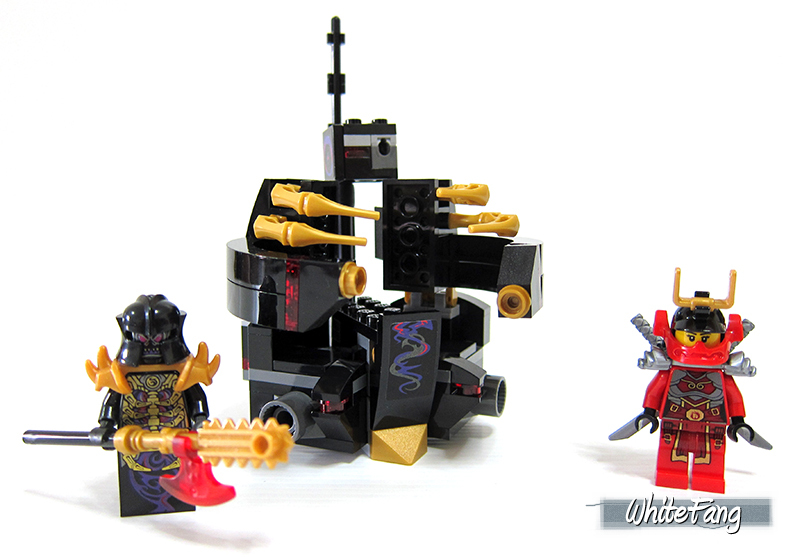 This is the best set of the whole Ninjago theme in my opinion. You should have gotten it. I hope you can still find good buy for this set. I got listed the spares inside my review. Please take a look at the links carefully under the sealed content. Great to know that you have enjoyed it and also equally pleased that you got a good price for it as well. I just scored this set at Target for $80. Can't wait to build it. Another great review! I really like the building and tree. 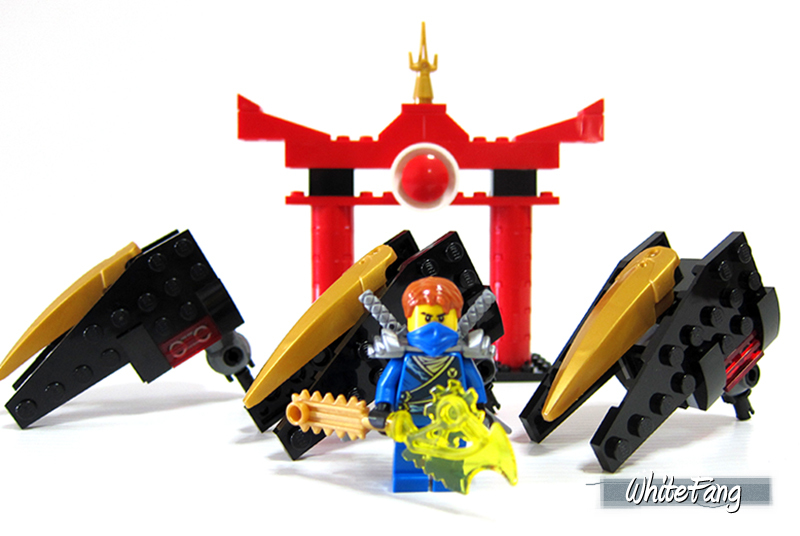 I am not a fan of Ninjago, but after reading your review I am tempted to get this set just for the build and the parts pack. Again this review is an example of a great self-contained review that allows the reader to really get a sense of the set. Good review. I saw it on clearance at Walmart, so I guess now is a good time to get it. Great set! Thanks to this review, I got this set. I just got back from a 7 day California coastal cruise and I built this set during downtime while on the cruise. When we unpack I will see how well it survived the trip home. This was an interesting and fun build with some very interesting and new (at least to me) build techniques. Now after some study it will become a very nice parts pack. Maybe I will sell the mini figures as a group. Well, we got unpacked and here is how well the Battle for Ninjago City survived. 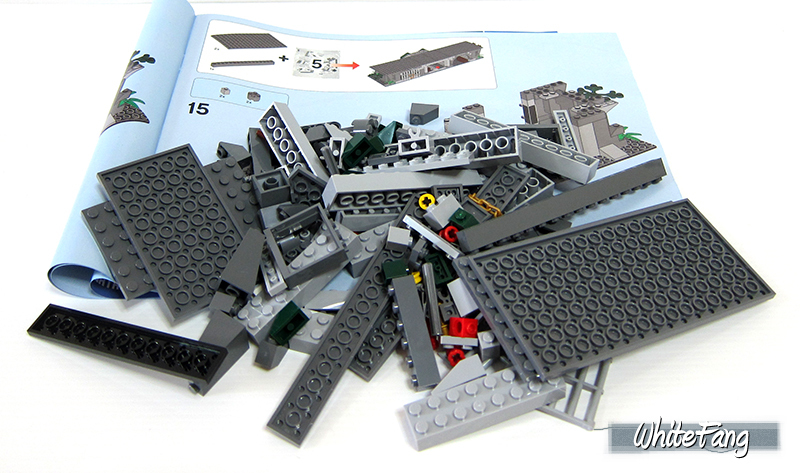 As you can see, not very well, but looking on the bright side, now I get to assemble it again. Well, there you go, photographic proof of how well an assembleld LEGO set survives baggage handlers. Note that this was only from the ship to the dock and to may car, no airlines involved. 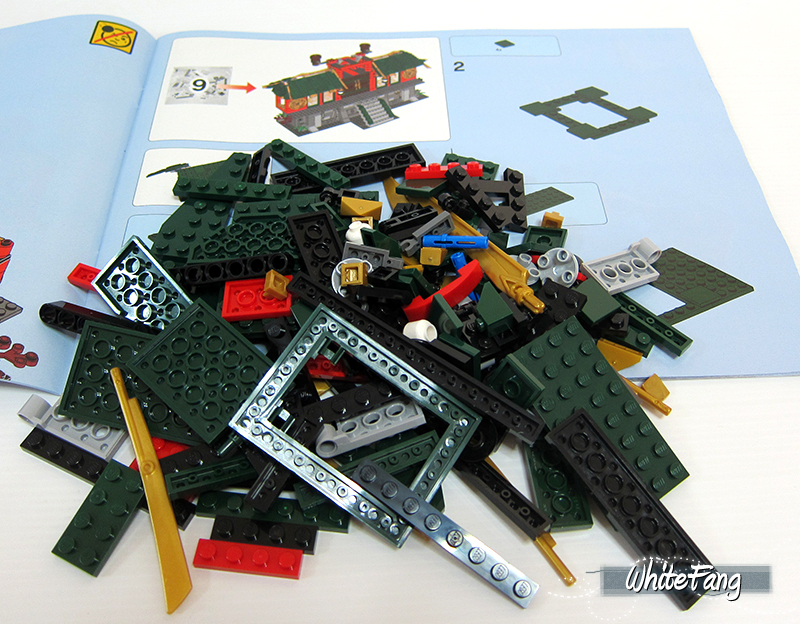 But I do get to assemble it again and because I packed it in sections it shouldn't be too difficult. 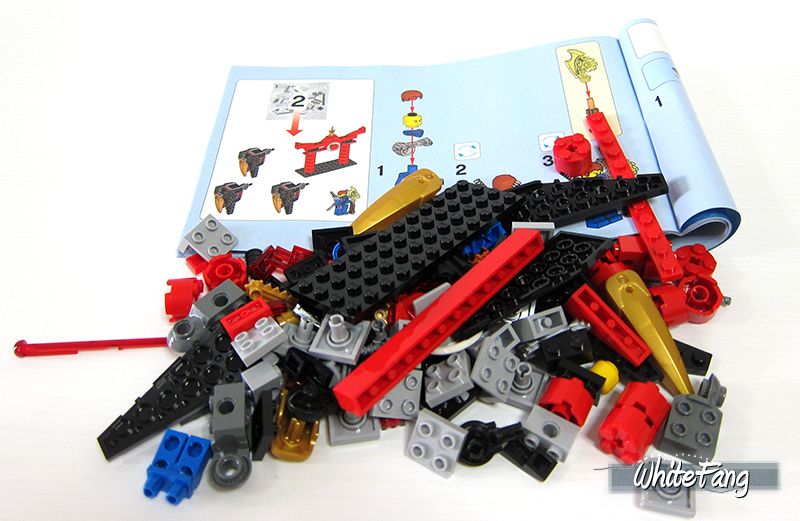 Overall, I still think this is a great set, fun to assemble and a good parts pack. I am glad I dint buy it...Airjitzu temple HOOORAY!!!!!!!!!!!!!!!!! !